I'm using Mastercam 2018 and I am trying to rename the the NC name after merging two Mastercam files together in my Chook. I want to change the name to something different than the original MC file name. I cannot seem to figure out how to do this. I have tried renaming the NCI name but that doesn't change it. I don't see a way but I think there must be. Any help would be appreciated. Mplmaster is based on CNC Software's master mill post - Mplfan - but offers additional features. eMastercam.com is operated by In-House Solutions Inc. - Authorized Canadian Distributor. Please do not email post requests or support questions. For post requests or support contact your local reseller. Click the download button above to download Mplmaster for 2018. It's our master configurable lathe post. You may also read instructions for: Installing a post Email feedback to our Post Department. Note: To download this file you must have purchased something through the eStore The Mastercam 2018 for SolidWorks Home Learning Edition allows you to use Mastercam for SolidWorks on a trial basis. Please note: this is add-on software for SolidWorks. A full seat of SolidWorks is required. 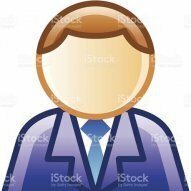 You are downloading an 874MB ZIP file (.zip). Once you have it downloaded, extract the files to a location on your computer you can find easily. Run the Mastercam_Installer.msi file to install the demo. 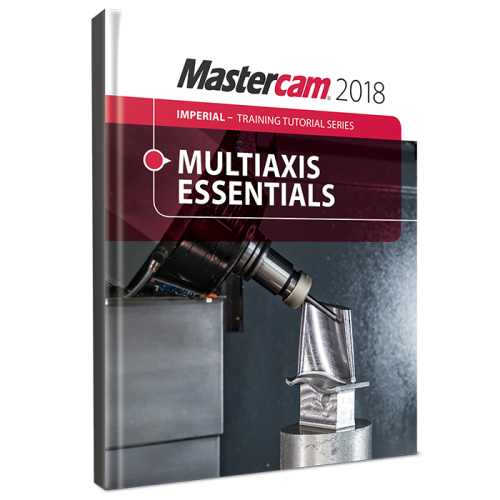 The Mastercam 2018 Multiaxis Essentials Training Tutorial is intended for the advanced Mastercam user looking to learn Mastercam Multiaxis programming. A firm grasp on both 2D and 3D machining is required and can be attained by completing the Mill Essentials and Mill Advanced Training Tutorials. The Intro to Multiaxis Training Tutorial covers the different applications that are available by configuring the Rotary Axis Control page including: Rotary axis positioning and Axis substitution. The book also covers the Multiaxis Classic family toolpaths: Rotary, Curve, Swarf, Flow, and Msurf. A special tutorial is dedicated to teaching how to drill and circle mill holes using Multiaxis toolpaths. Specific parameters such as Cut patterns, Tool Axis Control, Limits, Collision Control, Linking and more are described in detail. The contents also describe how to verify the toolpaths using the new Machine Simulation module that combines toolpath backplot mode and material removal mode with collision detections. 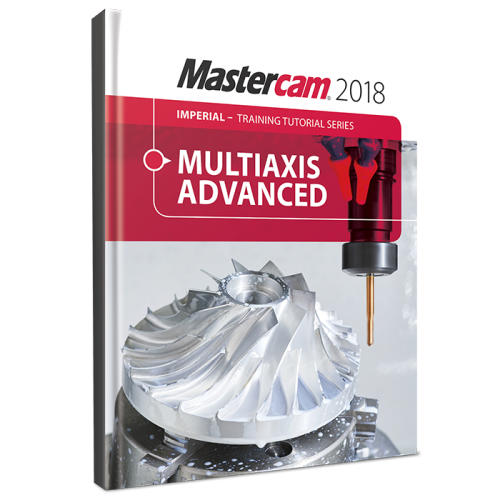 Intended for the advanced Mastercam user, this book contains new projects demonstrating a variety of Advanced Multiaxis milling applications. The initial tutorials introduce Mastercam’s simplified multiaxis user interface featuring custom application toolpaths, and they later transition to the more advanced interface. Topics include Tool Box toolpaths such as Projection, Impeller floor surface and Impeller blade swarf finish toolpaths. From the Wireframe toolpath family, you will learn how to use Parallel to multiple curves and Morph between two curves. You will also generate rough and finish toolpaths from the Surface/Solid toolpath family, such as Morph between two surfaces, Parallel cuts, Swarf milling and Parallel to surface. Additionally, a special project is designed specifically to familiarize you with different Collision control strategies and how to verify the toolpaths using the new machine simulation module that combines toolpath backplot mode and material removal mode with collision detections. 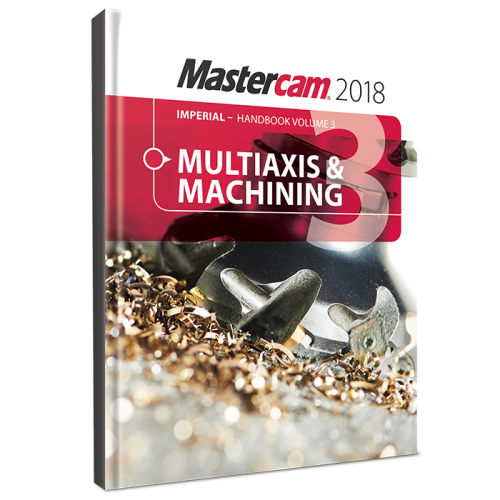 The Mastercam 2018 Handbook Volume 3 provides an academic approach to teaching Mastercam Multiaxis. The material intertwines conceptual subject matter with practical applications most suitable for intermediates or individuals that have completed Volume 1 and Volume 2. This book teaches Multiaxis and advanced toolpaths. 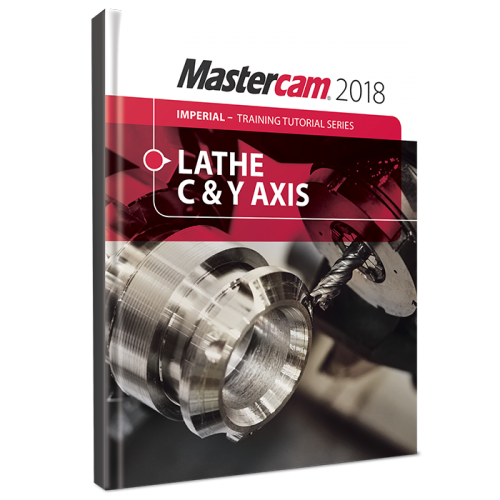 Ideal for industrial training settings, the Mastercam 2018 Lathe Professional Courseware offers an in-depth look at Mastercam lathe geometry and toolpath creation. Training exercises and drawings covering the 2D geometry functionality are provided to promote learning through practice. Additional Mastercam files are also provided along with guidelines for creating the toolpaths to machine each part. Advanced toolpaths such as the Misc Ops and C-Axis toolpaths are also described within this book. The tutorial consists of part-oriented tutorials intended for the advanced lathe user that wants to learn how to program lathe parts that include milling operations. You must have the Mastercam Lathe and Mill Software in order to use this tutorial. You will learn how to create the more complex 3D geometry and Advanced C-Axis toolpaths. The tutorial also covers toolpaths that support the Y-axis rotation and examples on how to use the Mill toolpaths on a Lathe with Live Tooling. 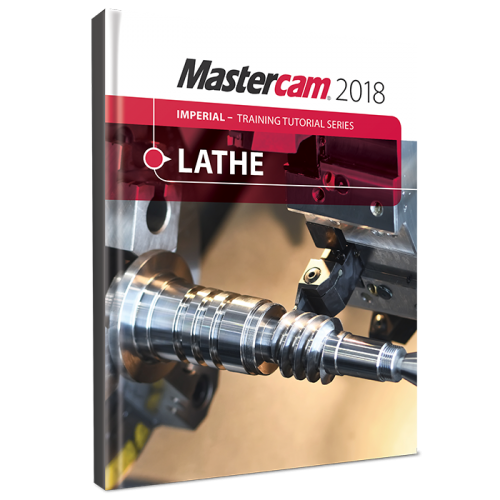 The Mastercam 2018 Lathe Training Tutorial consists of part-oriented tutorials, and practice exercises that provide users with an excellent foundation in Lathe. The material emphasizes the machinability of parts with suggested fixtures, setup sheets & more. The Lathe Training Tutorial is ideal for beginners and current Mastercam users alike. Step-by-step tutorials introduce 2D geometry creation along with detailed coverage of 2D toolpaths such as Face, Rough, Finish, Drilling, Grooving, Grooving on an angle, Inside Boring, Cutoff, Threading and Canned Cycles for Rough and Finish. Details on Stock Transfer, Stock Flip, Stock Advance and tailstock toolpaths, in addition to instruction on importing a SolidWorks file and using the Turn Profile command to create Geometry and a VTL tutorial are also found within. The Mastercam 2018 Handbook Volume 2 provides an academic approach to teaching Mastercam 3D modeling and machining. The material intertwines conceptual subject matter with practical applications most suitable for intermediates or individuals that have completed Volume 1. This book teaches advanced 3D CAD modeling and machining. 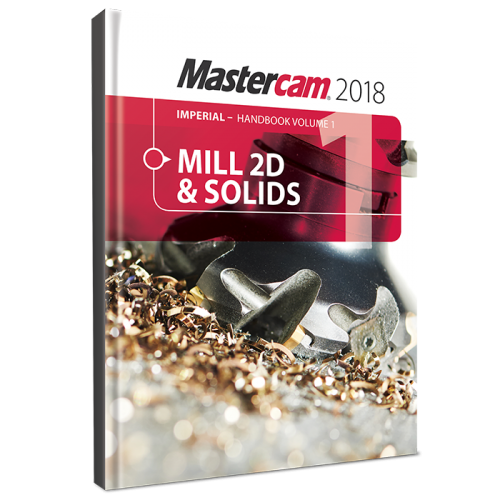 The Mastercam 2018 Handbook Volume 1 is an excellent resource that teaches the theory of Mastercam Mill and Solids. The material intertwines conceptual subject matter with practical applications suitable for beginners and intermediates alike. You not only learn how to use Mastercam, but why things work as they do. This book teaches basic/advanced principles of 2D CAD modeling and machining. 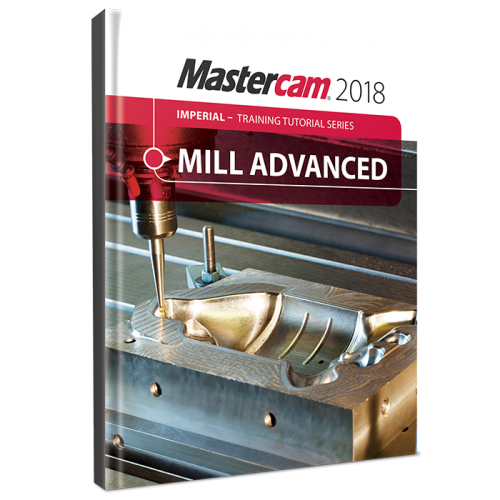 The Mastercam 2018 Mill Advanced Training Tutorial contains projects and accompanying practice exercises that span a wide degree of complexity. It is strongly recommended to have a good understanding of 2D machining (provided in the Mill Essentials Training Tutorial, for example) before beginning this book. All of the parts are designed with machinability in mind and include suggested fixtures and tool setups. Clearly laid out objectives and dimensioned step previews make it easier than ever to follow along. The content covers 3D wireframe, surface geometry creation and solid creation, Surface Finish and Roughing toolpaths. An emphasis is put on the advanced Surface High Speed toolpaths, STL Stock creation and its use in solid model verification. Also covered is how to create and manage Stock models in the Toolpath Manager. Machine Simulation is used to check for collisions between the part, the tool and any of the machine’s components. 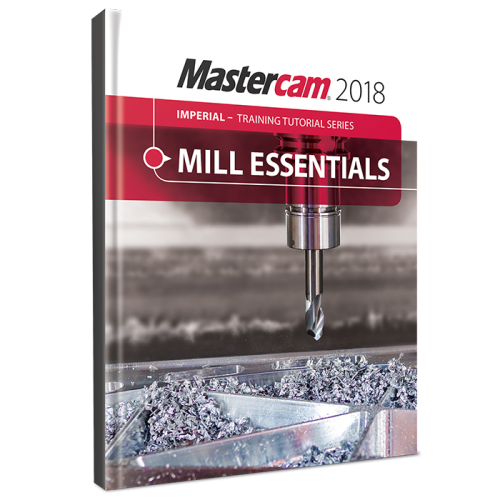 The Mastercam 2018 Mill Essentials Training Tutorial features concept-filled tutorials, challenging practice exercises and short quizzes following every tutorial providing a very comprehensive look a virtually all aspects of 2D machining. This book begins with the absolute basics by introducing the Mastercam user interface and it will have you creating geometry, drilling and creating contour toolpaths before you know it. Its gradual progression lends way to more advanced concepts such as multiple setup scenarios and 2D High Speed Toolpaths. All of the parts within the book are designed with machinability in mind. A multitude of topics are covered including 2D geometry, solid geometry, tool settings, stock setup, drilling, tapping, contouring, pocketing, circle milling and slot milling. You will learn the 2D High Speed Toolpaths such as Dynamic Mill, Area Mill, Dynamic Contour, Peel Mill & Blend Mill, how to import a solid and machine it and using the WCS in multiple fixture applications. Just wanted to let the community and moderators know that the most current update of Windows 10 completely disabled both Mastercam 2017 and 2018 HLE Edition for my desktop computer. Upon startup after successfully running though a few processes mastercam will stop on line commands and not progess any further, the blue wheel of death shows up and the only way to end the program is with Task Manager. Saw a suggestion on a thread saying that rolling back the update could fix this problem and after trying this fix it seemed to correct both of them so that they now load and run correctly. Is there any solution for this problems if I was to update back to the most current update? I tried the NVIDIA driver fix but it didn't seem to work, i'm not actually sure if my computer is running an NVIDIA drivers. This is a problems that needs to be fixed. Thanks, Robert. Hey every, So, I upgraded to 2018 today, and after a bit of a rocky start I've come across a problem. The problem I'm having is with chaining Wireframe, I've used mastercam for over 10 years and know exactly how chaining wireframe behaves. In 2018 it is not behaving the same. I click on my line at where I want it to start and which direction, and it puts the start point 2 entity's away chaining in the wrong direction. So I think "Oh my chain must have a gap". So I trimmed everything and it's fine. Yet it still won't chain correctly. I can correct it after I chain, but If i have to correct it EVERY chain that doubles my programming time. I played around with the options under the chaining tab and nothing changed, I played with the chaining tolerance under Chain Manager and nothing. Any Ideas? I imported the geometry to 2017 and it works as it should there.